The present general terms and conditions (“Terms and Conditions”) shall apply to all contracts which are made with any company or legal entity (“Client”) for the sale and supplies of Spencer Italia S.r.l. a socio unico ("SPENCER") products (“Products”). These Terms and Conditions shall replace any previous terms and conditions whether written or oral. The Client has read and understood the present Terms and Conditions and agrees that issuing a purchase order (“Order”) shall constitute Client’s acceptance of the same Terms and Conditions. Any agreements which may, in any way, differ from the present Terms and Conditions, any amendments or supplements thereof, shall only be binding, if confirmed by Spencer in writing. 1.1 Offers by Spencer (“Seller”) shall not be binding, in particular with reference to quantities, price and time of delivery. 1.2 Tailored orders shall be paid in advance (70% of the total value of the order). 2.1 “Order” shall mean the purchase order and all its attachments and exhibits referred to the Products. When accepted by Spencer (the “Seller”), the Order shall constitute the entire contract between the Seller and the Client. 2.2 Orders placed by the Client shall not be considered as accepted before these have been confirmed by the Seller in writing, depending on the stock availability. If the Seller fails to confirm the Order in writing, the Seller’s invoice or the execution of the Order by the Seller shall be considered as confirmation. 2.3 Any change to the Order by the Seller shall be considered definitively accepted by the Client who doesn’t expressly refuse the same changes within 24 hours from SPENCER confirmation of the Order. 2.4 An accepted Order can’t be unilaterally cancelled by the Client. 2.5 Minimum orders of 1000.00Euro + V.A.T. (if applicable) are required. 3.1 Prices of the Products shall be those indicated in the price list. Prices may, at any time, be adjusted by the Seller due to any factor affecting the price structure such as: raw material prices, taxation, transport and insurance charges etc. 3.2 Prices do not include V.A.T. 3.3 Prices do not include secondary packing costs which shall be separately debited to the Client. 3.4 In case of UE or EXTRA UE delivery, the Client shall pay 8,00 EUR penalty per pallet or box for each week (or part of week) of delay in collecting the goods starting from 15 days of ready goods communication. After 4 weeks of delay, the goods will be re-stocked and the Client shall pay, as "Handling fee", a sum equal to 20% on the total value of the same goods. 4.1 Unless otherwise agreed by the parties, advanced payment is required. 4.2 If the Client fails to comply with the payment terms, SPENCER is entitled (without prejudice to any other remedy it may have) to, at choice to suspend deliveries or to debit interest ex Dlgs 231/2002 at the current interest rate, or to terminate the contractual relationship with the Client. In any case, SPENCER shall be entitled to claim damages and to recover all relative legal costs. 4.3 If the Client fails to comply with payments terms any outstanding amount shall be immediately and fully paid as payment by installments shall be considered immediately revoked. 4.4 The Client is not allowed to settle outstanding debts with any amount owed by SPENCER also related to Products which have been returned under warranty. 4.5 The warranty period for spare parts used during a repair under warranty, is 90 days as from the date of the relative repair. 4.6 In case of unjustified returned products, Spencer Italia S.r.l. a socio unico reserves the right to apply the 30% of the relative price as handling fee. 4.7 The warranty period for spare parts used during a repair under warranty, is 90 days as from the date of the relative repair. 4.8 In case of unjustified returned products, Spencer Italia S.r.l. a socio unico reserves the right to apply the 30% of the relative price as handling fee. 5.1 Deliveries are “EX WORKS” for UE clients and FCA SALA BAGANZA for EXTRA UE clients (as defined by the ICONTERMS 2010 and successive amendments, if any). If the Client does not take delivery of the Products at the agreed time, the Seller has the right, without prejudice to any other remedy it may have, at the Client’s risk and expense, to hold the Products or to ship the Products to the Client. 5.2 Delivery times as indicated in the Order are approximate. They are given for convenience only and shall not be binding for the Seller. 5.3 Delivery times shall be calculated as from the date of the confirmation of the Order considering the working days, expressly excluding Saturdays, Sundays and Public Holidays. 5.4 If the Client fails to collect the Products within the agreed times, storage costs will be debited by SPENCER for each day of delay in collecting. 5.5 The Products shall remain in SPENCER’s property until full payment is made. 6.1 Spencer Italia S.r.l. 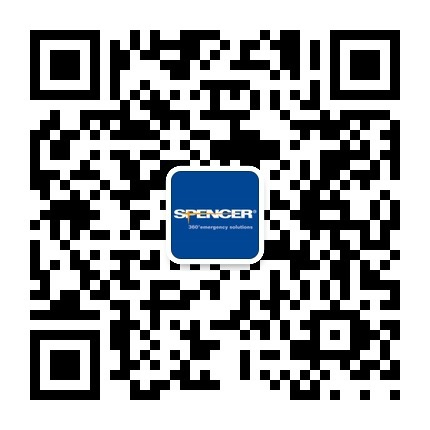 a socio unico warrants Spencer products for a period of 12 months; terms of guarantee are available on our website http://support.spencer.it/en. 6.2 It is the responsibility of the Client to check the Products immediately when receiving them. Any claims as to their quantity and or their quality must be notified to the Seller (by means of a registered letter with return receipt requested) within eight days from the date of receipt of the Products. 6.3 In case of non visible defects, the relative claim must be notified to the Seller (by means of a registered letter with return receipt requested) within eight days - and not later than 12 (twelve) months - from the date of discovery of the Products. 6.4 In the event of defects which are attributable to the Seller, the Seller shall have the option of either (i) replacing the Products or (ii) refunding the price of the Products which have been returned and which the Seller acknowledges as defective. The Products can only be returned to the Seller by agreement between the Client and the Seller and subject to the Seller’s instructions. In particular: (i) any return of defected Product (or part of them) shall be previously authorized by Spencer Customer Care; (ii) the defected Products (or part of them) shall be returned, at the Client’s cost, duly packed in their original packing (which is an essential condition in order to apply the warranty) strictly complying with the Seller’s instructions; (iii) the Client shall provide the Seller with any useful information it may require. 6.5 In case the Client is one of Spencer’s distributors, the Products which have been sold to the final client shall be under warranty only on the condition that the same client proves the Products have been purchased, indicating the details of the relative invoice or delivery note. In any case, the Seller shall have no liability whatsoever for the improper use of the Products by the Client and/or by third parties nor for any injury to persons or damage to property arising out of such use. Under no circumstances shall the Seller be liable for indirect, consequential punitive and/or unforeseeable damage. 6.6 Unless otherwise agreed, SPENCER, doesn’t directly provide technical assistance. As a consequence, any repairs of SPENCER’s medical devices (the “Products”) must be done by SPENCER’s authorized service centers who provide quality repairs using original spare parts according to the manufacturer’s instructions. 6.7.4 refusal to pack the Products as recommended by SPENCER. 6.8 If the Clients fail to comply (even partially) with the payment terms, warranty will not be applied. 6.9 Warranty does not cover accessories, components, materials and/or equipments which are not manufactured by the Seller. 6.10 All expenses and risks linked to the transportation of the Products from/to SPENCER’s or its authorized service centers, shall be borne by the Client. 6.11 Unless otherwise indicated, the Client must comply with “technical specifications” which offer the necessary safety. The Client must previously verify that the product fits for the purpose checking the dimensions and all other relevant details. Technical information about the Products contained in the price list are liable to changes. 6.12 If the Client is a distributor it will be his responsibility to check that the Products sold to third parties are complete with all attachements: specifications; warnings; labels; user’s handbook; terms of warranty and any other useful information. As to weldings, in case of lack of specific instructions about dimensions and position, the Client accepts SPENCER’s in-house operational parameters as per WPS available in the central files. As a consequence the level of acceptability of the welding shall be the one provided for UNI EN ISO 5817 level D.
8.1 The Distributors shall promptly inform the Seller about any and all legal requirements (including safety requirements) in force in the Country where the Products will be sold, in order to allow the Seller to conform to the same regulations. 8.2 Distributors are aware that in the event of any failure to conform to the above mentioned requirements they will be deemed fully responsible for all damages that might occur. Therefore SPENCER expressly disclaim any responsibility and/or liability consequent to non-compliance with the present article. 9.1 Information about the Products, contained in the price list, are not relevant for the origin of the Products. 10.1 The Products as listed in SPENCER’s general catalogue might be patented. In any case, SPENCER is the exclusive owner of trademarks and patents with any consequent rights. 11.1 The parties agree that their contractual relationship is governed by Italian law. The parties shall make all reasonable efforts to settle any dispute arising in connection with the validity, performance, interpretation of the contractual relationship between them. For such purpose, each party undertakes to promote an attempt of conciliation according to the Rules of Conciliation of the International Chamber of Commerce in Milan. Should it not be possible to reach an amicable settlement, then all disputes shall be subject to the exclusive jurisdiction of the Italian Court in Parma. Pursuant to European Directive 93/42/EEC concerning Medical Devices the Distributor declares its organization complies with the legal requirements for “good distribution” (Good Distribution Practice). 1.1 Not reproduce any graphical representation of the Products, for any reason. 1.2 To meet the specific requirements of the customer, without offering guarantees other than those covered by specific agreements with SPENCER. 1.3 Not alter the packaging of products (with the exception of the identifying mark of the distributor on the outer packaging only). If the Distributor also acts maintenance center and/or car repairers’, the packaging may not be tampered with until the time of installation of the device. 1.4 To comply strictly with the technical specifications defined and indicated by Spencer Italia S.r.l. a socio unico. Any different value shall be expressly (in writing) authorized by SPENCER. 1.5 To ensure traceability of the medical device, using the same criteria applied by Spencer Italia S.r.l. a socio unico (by identifying the end user, the serial number of the Code of sale delivered). In particular, the Distributor shall (i) keep the relative records for a period of, at least, ten years from the date of distribution of the concerned medical device and (ii) immediately notify Spencer Italia S.r.l. a socio unico about any loss, theft, destruction (for whatever reason) of the medical device. 1.6 To submit to Spencer Italia S.r.l. a socio unico the records of distribution, when so requested. 1.7 To keep the products properly in suitable warehouse. 1.8 provide the Clients with all Spencer’s technical documentations (including User’s Manual) related to the Products and contained in the relative packaging. 2. THE EXTRA CE DISTRIBUTOR further declares he knows the applicable legislation in his Country. Therefore, the Distributor warrants he will, at all times, comply with the relative applicable legislation, statutory instruments, rules and regulations. In particular, the Distributor shall promptly notify Spencer Italia S.r.l. a socio unico which of the Products needs to be registered in his country in order to be so authorized in writing by Spencer Italia S.r.l. a socio unico. It is understood that, together with the written authorization, Spencer Italia S.r.l. a socio unico will provide the Distributor with the documents which may be necessary for the registration, as they will be expressly required by the Distributor. 3. THE EXTRA CE DISTRIBUTOR is responsible for the translation of the user’s manual, technical specifications and to any other technical documentation. 1. Indemnify and hold harmless Spencer Italia S.r.l. a socio unico from any claim from third arising out and resulting from the incorrect and or unsuitable storage of the Products by the Distributor. 2. Promptly notify the Manufacturer (within 3 days of receipt of the report) any and all claims, accidents or any other technical problem concerning the use of the Products by the Customer. 3. Notify the Competent Authority local, only if so expressly requested by Spencer Italia S.r.l. a socio unico. 4. Cooperate with Spencer Italia S.r.l. a socio unico in collecting information on accidents or any other technical problems concerning the Products. 5. Collect and transmit to Spencer Italia S.r.l. a socio unico any information about the use of the Products which is deemed useful to modify or improve their level of safety. 1. The warnings do not include the withdrawal from the market of products for commercial reasons. 2. In the event of any warnings, the operations will be carried out and coordinated by Spencer Italia S.r.l. a socio unico. 3. It is necessary to cooperate strictly with Spencer Italia S.r.l. a socio unico for any warning or similar action. 4. The timing of any warnings must be agreed from time to time as suggested by Spencer Italia S.r.l. a socio unico. 5. It is necessary to keep the withdrawn products while waiting for specific written instructions by Spencer Italia S.r.l. a socio unico. Extra CE Distributors shall bear any costs related to the translation of the user’s manual, technical specifications and to any other technical documentation. Unless otherwise agreed in writing by the parties, Extra CE Distributors shall also bear the costs related to the registration of the Products in the interested area. For the purpose, the Distributor shall previously check the correctness of the data with SPENCER.